Energize your art! Add texture and dimension with high quality canvas options. 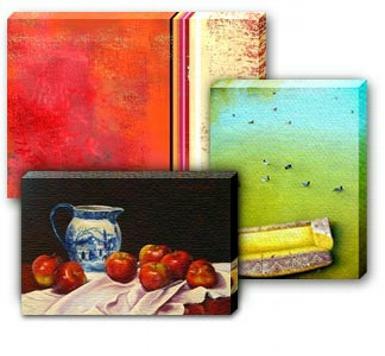 Canvas art prints are the ideal way to bring your artwork alive, giving it a rich, textured look. You have two canvas wrap options on two high quality fine art canvas choices, including a matte or gloss option that is sure to set your images apart. Choosing canvas for your fine art prints is an excellent choice when you want to maintain all of the sophistication and simplicity while making an impressive impact with your art selection. My fine art printer creates high-definition, long-lasting, luxurious-looking canvas prints that are incredibly versatile and a great way to create a ready-to-hang work of art. They offer one of the most exceptional products that will last for generations. This exceptional matte canvas choice is made from an extremely durable, quality canvas blend of 65% polyester and 35% cotton. This heavyweight and textured canvas utilizes a tight weave that is ideal for all fine art giclee prints. The gloss canvas option provides a slight sheen that adds depth and brilliance to any image printed on canvas. This heavyweight and textured canvas also features a blend of 65% polyester and 35% cotton with a tight weave ideal for giclee art prints on canvas. Print on canvas - Art prints on canvas are an exceptional way to show your works of art. You have the option to choose just the unstretched canvas print alone, or with one of the canvas wrap choices. 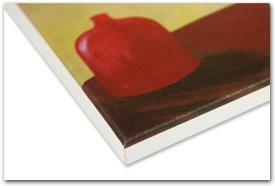 Choosing just the giclee print on canvas provides all the texture and quality without the rigidity of stretcher bars. Canvas Transfer - The canvas transfer process is a highly technical and detailed procedure that allows the printer/framer to offer images from the classical masters� museum art collection as fine art canvas reproductions. Transferring these published works to canvas requires a meticulous process to ensure the image renders just as the original. What is a Canvas Transfer? 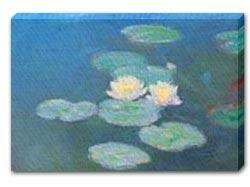 - A canvas transfer starts as a print or poster image that is then transferred and fixed to a canvas surface. The result is a piece of printed art that has the appearance of an original canvas painting without the higher cost usually associated with original artwork. This detailed process also preserves and protects the image. In the final stages, the canvas is then stretched and fit onto a custom-cut wooden frame. First, the print is coated, via spray or brush with a special acrylic that seizes the ink. After drying the resulting ink film is embedded into a high quality artist�s canvas. Rigid standards and meticulous attention to detail maximize ink retention, paper removal, and bonding. Then, the picture has an image true to the original painting with a lustrous oil sheen and rich canvas texture. This is known as a basic transfer. Finally, artists can hand apply acrylic in the pattern of the original piece which creates an original brush stroke texture. This adds texture and realism to the canvas transfer, and is particularly effective for images of paintings in styles using heavy coats of paint, such as impressionism or many modern abstracts. The result is artwork that captures the very soul of the original painting. Please note that brush stroke texture is available for a small extra charge by emailing Customer Service. Canvas Wrap - You have two different ways to create your art print on canvas as a ready-to-hang work of art; museum wrap and gallery wrap. 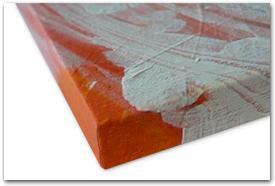 Both canvas wrap options utilize museum quality stretcher bars providing you with a finished work. The canvas is outfitted with a saw tooth bracket making it ready to hang as soon as it arrives. On both of the wrap choices the canvas is stretched around specialized wood bars and securely stapled to the back. After the canvas is stretched, you can choose to frame the wrapped canvas with one of the specialized custom frames, or leave it exactly as is. Museum Wrap - Choosing the museum wrap option makes the entire image viewable while looking at it straight on; no part of the image is lost around the stretched edge. With the museum wrap option, the canvas is stretched around 5/8� thick wood support bars and leaves a white border on the edges of the stretched canvas. If there are vital parts of the image near the edge of your art, museum wrap is the way to go. Gallery Wrap - The gallery wrap option stretches the image around the entire width of the stretcher bars, making a portion of the image viewable from the sides. For the gallery wrap canvases, 1� thick wood support bars are used, so expect to lose at least an inch of the image on each side when viewing it straight on. Keep in mind that anything close to the edge of your art will be folded over the sides, so make sure to choose this option only if vital parts of the image are not close to the edge. Canvas Construction - All of the canvas art prints are produced using premier products that ensure your artwork will last for generations. Everything from the canvas choices to the construction of the canvas wrap options are produced with the utmost care. The printer/framer uses only the finest materials that include heavy-duty museum quality stretcher bars so the stapled canvas remains tight and in place. The staples on the canvas prints are behind the stretcher bars so that no staples show. In addition, a plastic coated wire is attached for easy hanging and felt tabs cover the hardware so no damage is done to your walls when you hang your canvas wrapped work of art. Long Lasting - All of ther giclee prints on canvas are created using long-lasting archival inks that have received permanence ratings that well exceed 100 years. In addition, the canvas prints are treated with a UV and water resistant coating that protects against fading and dust, ensuring your fine art canvas print will keep its original brilliance for generations.